Fourteen years ago, it all began quite modestly with Thai Bamboo opening its first location, a quaint restaurant along Sprague Avenue in Spokane Valley. 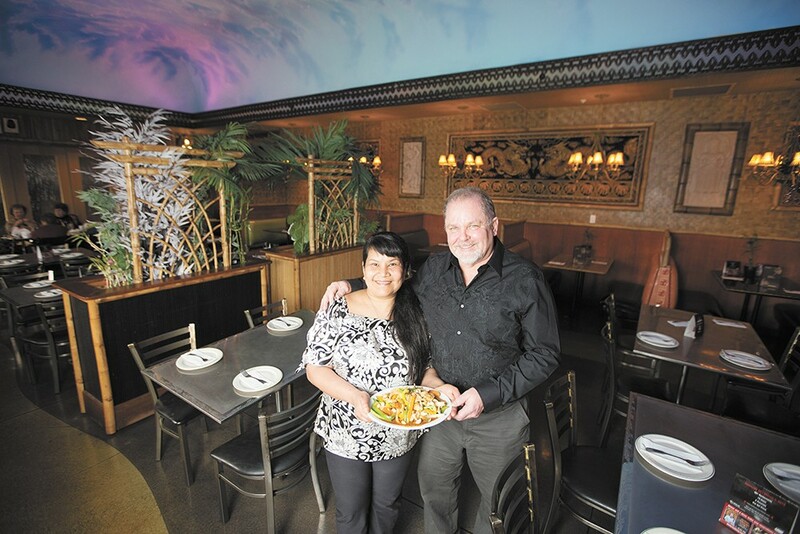 Owners Tom and Matavee Burgess first met at Jai Thai, the restaurant Matavee used to own in Seattle. After the couple moved to Spokane in 2000, it was only a year later that they signed a lease to open the first Thai Bamboo. Tom, who grew up on the South Hill, did the marketing. Matavee, who is from Thailand, ran the restaurant. Now they're celebrating 10 Best Of wins and membership in the Hall of Fame. "She had the skills and the recipes and we started out with a big menu," says Tom. Every few years, they added a new location: South Hill, Coeur d'Alene and their flagship restaurant in North Spokane. The latter is the most grandiose of the four, with a pagoda-style building pointing to the sky over Division Street and an interior overflowing with Thai décor. During trips to Thailand, Tom shops at the markets and brings back items like granite elephants, wood-carved statues, tapestries and sandstone murals, and he commissions artisans to make things like their embellished steel tabletops. "That's just kind of the icing on the cake," he says. "It's all about the food." Matavee, the head chef of the restaurants, came from a family of nine in southern Thailand. She was the cook of the family and the dishes at Thai Bamboo represent southern Thai cuisine, which tends to be a little spicier and have lots of curries and seafood. The enormous menu doesn't end there. A bevy of noodle dishes, soups, rice dishes, salads and even Chinese dishes keep the list going. The pad Thai has been the No. 1 bestseller over the years, says Tom, with the spring rolls, the Mongolian beef and the fried bananas drizzled in caramel following behind. Tom chalks up Thai food's popularity to the fact that it's healthy and easily caters to gluten-free and vegetarian dietary restrictions. Thai Bamboo makes it available in four locations across a sizable geographic spread. At Pho Van, the combinations are endless. 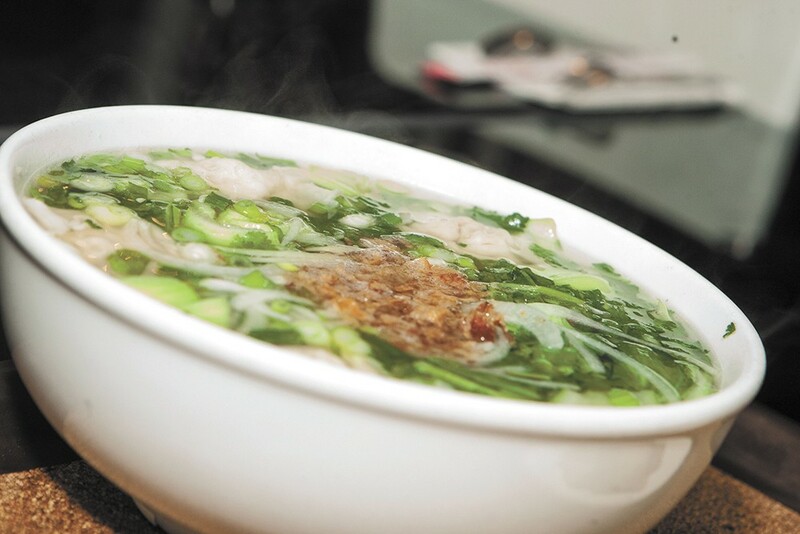 Pho, the hearty and healthy Vietnamese soup rich with rice noodles and meat, is truly an independent thinker's meal. In the mood for a dash of Sriracha and a squirt of hoisin? Have at it. Looking for texture? Toss in a few slices of raw, spicy jalapeño and a handful of mung-bean sprouts for snap. Don't forget the aromatic Thai basil and cilantro garnishes and squeeze of lime. Or leave them out. It's your choice, and the combinations are endless. Starting with delicious broth, however, is key, and this is where Pho Van excels. Pho Van owner Henry Cao has been dishing out pho to enthusiastic Spokanites for 10 years. Along with the best pho in town, Inlander readers devour Cao's perfectly crispy fried ch gio (egg rolls), bún (vermicelli noodles) and follow it up with dessert in a glass, cà phê á (iced coffee with sweetened condensed milk). But the pho is the star, and the selections of pho are compelling enough to keep your belly full year-round. Variations of pho tai (beef) dominate the menu, but Cao also offers pho ga (chicken) and pho tom (shrimp). Traditional pho broth relies on the harmonious marriage of ginger, cinnamon, star anise, clove, fennel and coriander. "Every family has their own recipe for broth. It's very healthy. My dad eats two or three bowls every day. He looks young, but he's not!" laughs Cao. Meat selections run the gamut from tame (eye of round steak) to the more adventurous (soft tendons and meatball). "We add all different kinds of meat. Pho tái nm (with eye of round steak and well-done lean meat) is the most popular," says Cao. As Pho Van's popularity continues to grow, so does the menu. Specialty soups, including barbecue pork and shrimp and duck with bok choy and fried shallots, provide a break from the norm, though they still have deep roots in tradition. Best Drive-Thru Espresso | DUTCH BROS. Many have been on staff for a decade. Michael DePasquale knows that feeding someone involves much more than food. With an associate degree from the prestigious Culinary Institute of America and more than 30 years experience, including as executive chef at the Coeur d'Alene Resort's Dockside and Tito Macaroni's restaurants, DePasquale knows what it takes. "A warm greeting, a clean atmosphere, a smile, a conversation, a big 'Hello' upon arrival and a big 'Thank you' upon leaving... this all adds up to 'feeding' someone," says the owner of Michael D's Eatery. That's what brings loyal customers like Rick Carr, who reckons he's been ordering the same breakfast — a modified Pasquale Scrambler — since the restaurant opened in 1998. "They're the only ones who can make my breakfast the way I enjoy it," says Carr, who owns Mix It Up boutique downtown. Bruce Nordstrom, who walked over from his home several blocks away, has made Michael D's part of his routine for two years. "It's just a friendly environment," he says, sitting at one of four chrome stools along the counter. Elsewhere, booths are packed with people of all ages and the room buzzes with happy diners loading up on chocolate chip pancakes, eggs Benedict, overstuffed omelettes and bottomless cups of coffee. 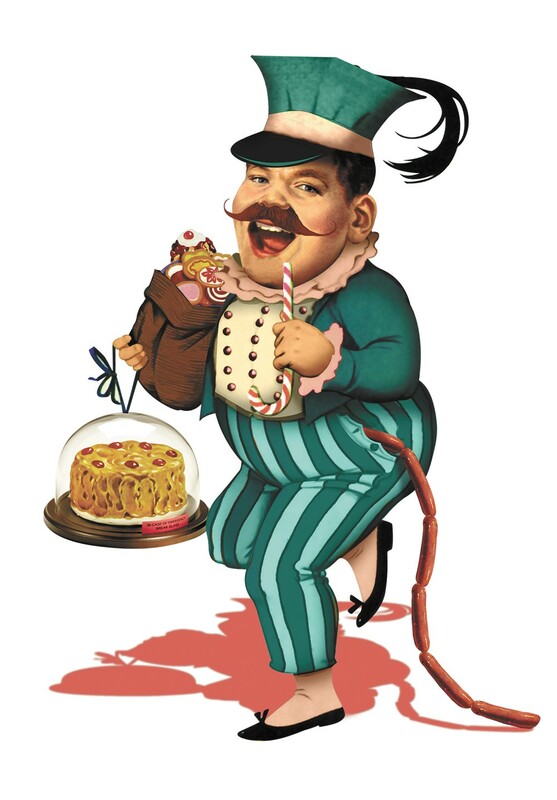 On the wall are photos of local landmarks as well as several Groucho Marx-like caricatures of DePasquale and his trademark glasses, similar to the one that appears on the menu and outdoor signage. And, like a junior high dance, chairs lining the waiting room walls fill up as hungry people help themselves to coffee and wait for their name to be called. DePasquale greets many by their first name. "We get some old-timers who had their first date here and bring the grandkids," says DePasquale. "Folks who lived here years ago come back and are thrilled to see it still going and, of course, want to share their story." Some of them, he adds, used to come in as customers and now work at the restaurant. His staff, says DePasquale, is the real reason for the restaurant's success. 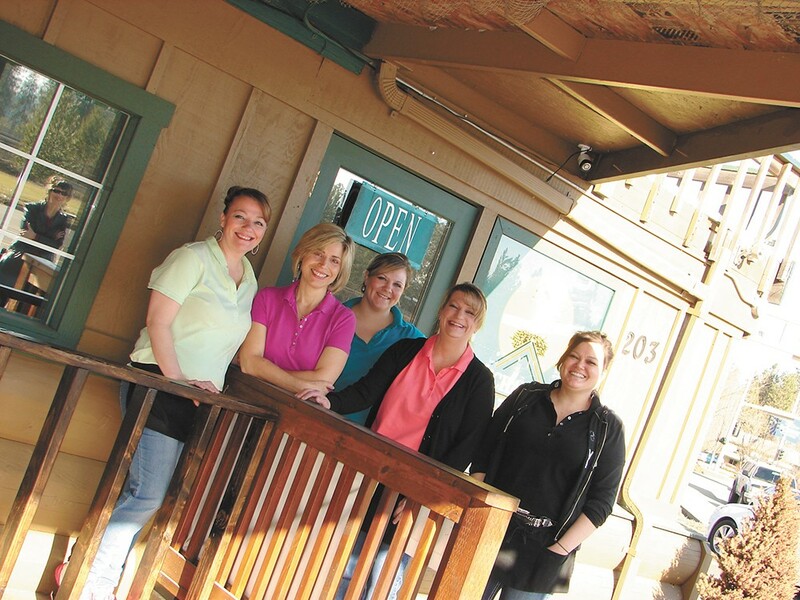 Nearly half of them have been with the place for more than 10 years. 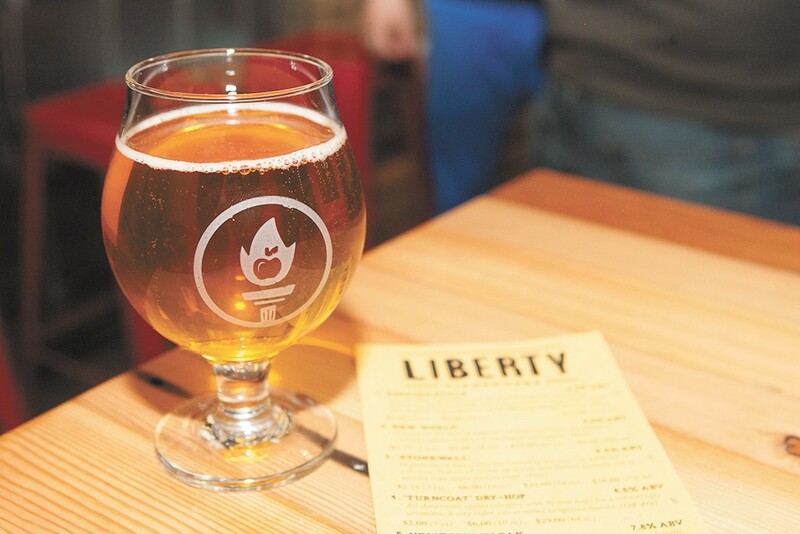 Find Liberty Ciderworks’ tasting room on Washington Street. Liberty Ciderworks co-owner Rick Hastings has a near-encyclopedic knowledge of cider. He can tell you, for instance, that they use one of Thomas Jefferson's favorite apples (the Newtown Pippin) in the eponymous single varietal, the difference between English- and American-style cider (the former uses cider apples while the latter uses all-purpose apples), both of which are offered at Liberty, and what food pairs best with cider (cheese, richer foods, spicy foods, lamb, pork). He also can break down the cidery's menu so that anyone, no matter how new to the beverage, can understand each varietal's composition. To name a few: There's Stonewall, the product of what happens when Liberty's English cider meets Dry Fly whiskey barrels; Turncoat, a blend of all-American apples and British hops; Crabenstein, a funky blend of Dolgo crabapples and Gravenstein apples that has stayed on the menu since its Halloween debut; and Jonathan, a customer-favorite single varietal that uses the apples of the same name. "A lot of people still think cider has to be sugary-sweet," Hastings says. "Craft cideries are making cider and being truer to the apple and being truer to the art form. If you try a cider like that, you'll be impressed." Hastings, who co-owns Liberty with Austin Dickey, discovered cider after looking for an alternative to beer with his brother and sister-in-law, who are gluten-intolerant. He told Dickey about his find, only to learn that Dickey had been making his own cider for years. Before opening the tasting room in April of last year, the duo bottled its cider to deliver to local bars and restaurants, while also making frequent trips to the westside to distribute the cider in Seattle, something they still do. It's been a strong first year for Liberty; last month, Hastings and Dickey hired their first full-time staff member to help with the growing number of sales calls and deliveries, a trend Hastings hopes will continue. The Awe Geez Burger from Wisconsinburger. It hasn't even been a year since Wisconsinburger introduced its menu of Midwestern fare to Spokane, but the city already has decided that its burgers are the best around. 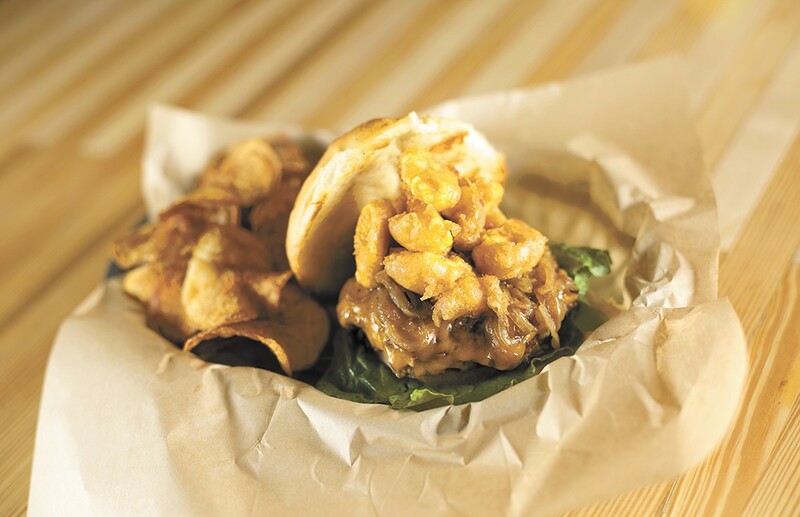 In April of last year, Jeff Nordvall and Laura Paisley opened the retro-style restaurant after traveling through the Midwest — where they're from — to visit family and making some nostalgic stops at mom-and-pop burger shops along the way. Back in Spokane, they used to own what was previously the Lantern Tavern, then a small, 12-seat bar, but after selling it, they wanted to do something bigger, something that harkened back to their Midwestern roots. "It's kind of fun, we have this pride of where we're from and we're loving it here, too," says Nordvall. They definitely feel the love from the surrounding South Hill neighborhood the restaurant is nestled into, but Nordvall says they also get customers — especially transplanted Midwesterners — making hour-long drives to come and dine. Paisley thinks the draw is Wisconsinburger's dedication to freshness. "The biggest thing that makes our burgers delicious is that we fresh-grind the meat every day," she says. The buns are delivered daily from Alpine Bakery, the fries and chips are hand-cut, the bacon jam found on the Spooner burger is made in-house and of course, the butter and cheese come from Wisconsin. So far the Wisconsin burger has been the most popular on the menu. When you bite into that simple combination of lettuce, tomato, Wisconsin sharp cheddar and grilled onions, you taste the succulence immediately and a pile of juice quickly forms in the basket below to tangibly prove it. As Spokanites scan the menu, Paisley says people usually have to ask, "What's a cheese curd?" Tiny balls of differently sized cheese curds — a byproduct of the cheese-making process — are deep-fried in Miller High Life batter. After popping one into your mouth, you know those greasy, golden lumps are dangerously addicting for any fan of things fried and cheesy. They come piled in a basket, or you can bite into them on the Awe Geez burger. "The formula [for Midwestern food] is always burgers, fried cheese curds and frozen custard — what we're working on now," Paisley says.